(BPT) - Have you ever wondered what’s in one of your favorite packaged foods, grabbed the box from your pantry, read the ingredients list ... and realized you still didn’t know what you were eating? The ingredients in some processed foods can read like a chemist’s shopping list. Now imagine if your backyard birds could read. What would they say about the ingredients in the food you feed them? A growing number of Americans are choosing natural foods for their pets; nearly a third say they prefer natural products, according to PetFoodIndustry.com. People who feed wild birds care about them just as much as their four-legged pets and want to know they’re feeding their backyard birds the most natural and nutritious options available. It’s hard to feel that confidence when reading the mystifying ingredient list on the feed bag makes you feel like a bird brain. Avoid seed blends that are full of cheap fillers, like oats and red milo. Fillers not only lack nutritional value; birds will kick them right out of the feeder. Select natural feed comprised of top-of-the-crop seeds and pass by seed coated with chemicals and mineral oil. Take note of ingredients you can’t read, often it’s an indication the ingredient is a synthetic or lab engineered. Ingredients like Menadione Sodium Bisulfite Complex and Thiamine Mononitrate aren’t found in natural food, they’re man-made versions of vitamins. Since wild birds normally get all their vitamins and nutrients from natural sources, adding a synthetic version is questionable at best. The rule of thumb for buying all natural is if you can’t read it, don’t feed it! Focus on serving feed with an ingredient list you can read and understand. For example, Cole's Sunflower Meats contains nothing but shelled sunflower seeds. Easy, right? It’s a favorite feed to a wide range of backyard birds, too. Either get to know the types of birds visiting your feeder and research feed they prefer, or buy feed from a reputable company who has already done that work for you. Cole’s offers select natural seed choices developed and based on factual research about what birds really eat. Feed is specifically formulated to attract certain species of birds as well as the largest number of birds, too. When you know and serve what your backyard birds prefer, you’ll keep them coming back to your feeders. Feel free to supplement seed and feed with natural food you already have at home. 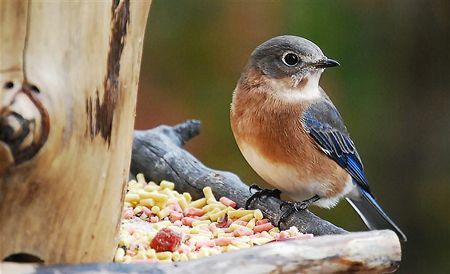 For example, jays and woodpeckers love raw peanuts, while mockingbirds and orioles love fruit, and chickadees, blue jays and cardinals savor suet. Soak raisins and currants in water overnight, then place them on a table feeder, or purchase blends with a dried fruit and nut mixture, like Nutberry Suet Blend. To attract orioles and tanagers, skewer halved oranges onto a spike near your feeders for a special treat. Don’t forget the importance of the right type of feeder. Dish and bowl feeders are great for serving fruits, while most birds will appreciate a terrific tube feeder for seeds both large and small. Traditional tube feeders are great all-purpose feeders, and a must-have for backyard bird feeding. Buy feed from companies who specialize in wild bird food. Some companies offer bird feed as a side product to their main business of pet products or grass seed. Cole’s exclusively produces and sells products for feeding backyard birds. To learn more about wild bird feeding and all-natural feed options with ingredient lists even birds could understand, visit www.coleswildbird.com.